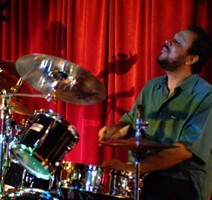 Drummer and Rio de Janeiro native Vanderlei Pereira is one of the most sought-after musicians on the contemporary Brazilian jazz scene. Combining a prodigious knowledge of Brazilian rhythms with dazzling technique and a distinctive touch, Vanderlei has captivated audiences around the world with his unique and electrifying performances. In addition to leading his own acclaimed Brazilian jazz group, Blindfold Test, he has appeared with numerous outstanding artists and ensembles, including Toots Thielemans, Airto Moreira and Flora Purim, Leny Andrade, Tito Puente, Arturo O’Farrill’s Afro-Latin Jazz Orchestra, Claudio Roditi, Romero Lubambo, Bebel Gilberto, Sivuca and Rio de Janeiro’s Orquestra Sinfonica Brasileira, among many others. A respected educator, Vanderlei’s knowledge of harmony and theory has enabled him to teach Brazilian music to all musicians, regardless of their primary instrument. He is an adjunct faculty member at the City College of New York (CUNY) and the New School, and has taught master classes at several universities and music conservatories.